North Carolina's Youth/Junior Triathlon State Championship will be contested in our 2nd series race prior to junior nationals in Westchester, Ohio. 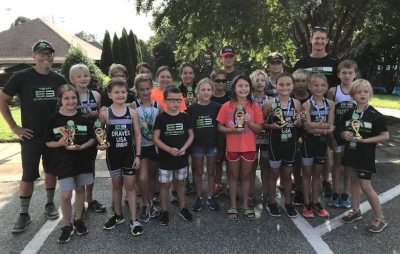 The Greensboro Youth Tri 7.03 Series is a three race series for the promotion and development of youth and junior triathletes. Ages 5 to 15 are welcome and encouraged to participate. These three USAT-sanctioned youth/junior races are based on USA Triathlon’s recommended youth/junior distances for each age group. 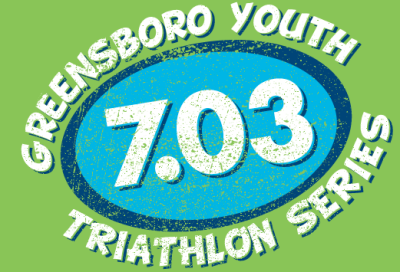 Greensboro Youth Tri 7.03 Series Finale where series point winners will be awarded "Youth 7.03 Champions!" 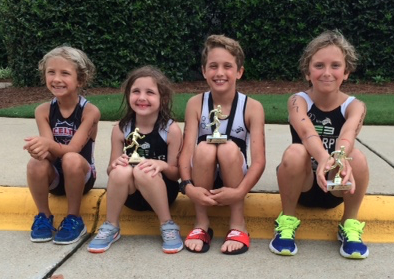 Check out our Junior Triathlon Team at our first Series race at Wet 'n' Wild! Age Group Wave Starts. 13-15yr old & Relays will be the first wave, and 5-6yr olds will be the last wave. There will be a lifeguard on duty. If you feel like you need assistance during the swim, roll over on your back and raise your arm in the air. Hard shell helmets must be worn and fastened before leaving the transition area. Stay to the right to allow faster cyclists to pass on the left. There will be vehicular traffic on the bike course. Be careful and stay to the right. There are plenty of volunteers but it is ultimately your responsibility to know the course and your distances. This is a 1, 2 or 3 loop bike course on smooth residential roads. The course has rolling hills but has been modified in 2017 to lessen the elevation change. Run course map is located in packet. The 1 K (.62mile) course will is an out and back course. The course will be well marked. There will be directional signs at every turn on the run course. Look for these directional signs. There are chalk arrows on the course. Simple rule of thumb: If you don’t see one of these directional signs – keep going straight. The aid station will be near the beginning of the run. No headphones, earphones, or radio-type devices will be allowed. You must have your run number visible on the front of your body as you cross the finish line. Relay Teams: Swimmers will exchange chip straps with bikers at their designated bike rack location in the transition area. Bikers will exchange chip straps runners at the same location. All relays will do the 13-15 division distance.